From your home page, you can click to view your schedule for each week that your coordinator has published. Click Schedule in the top menu (or the Show My Schedule button) on your Welcome page. 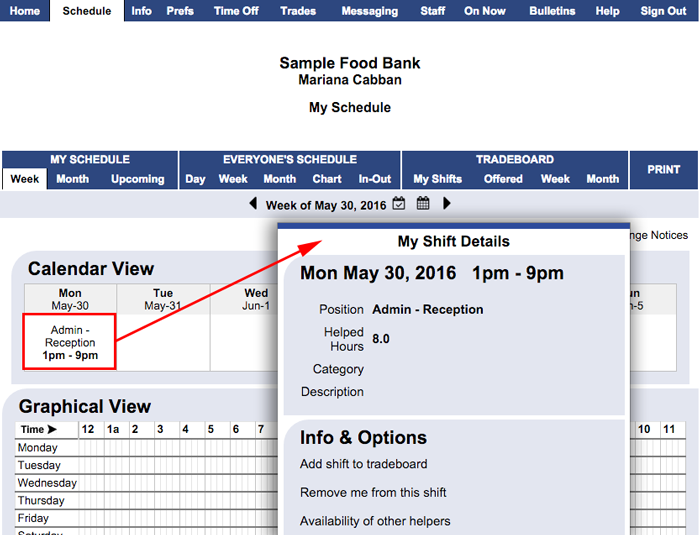 When viewing the My Schedule page, you can click any of your shifts to see more details, put your shift on the Tradeboard (if your coordinator allows use of the Tradeboard), or to see which helpers might be available to replace you for this shift. If your coordinator allows you to view Everyone's schedule, you also will see a link to the various schedule layouts for the complete schedule.